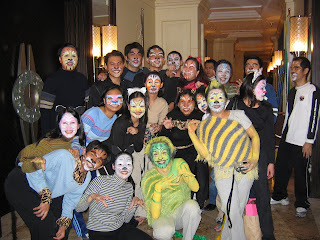 Last Wednesday, 13th of December, we had our Company Christmas party held in Manila Peninsula. It was such an extravagant event for the Misys employees. Cool raffle prizes, tasty foods, nice live band and great performances. Unfortunately, I did not won in the raffle... nakakainis nga eh. The foods were okay and again, unfortunately, i have to eat less due to my diet regime. The good thing about that night was that we won third place in the broadway performance. 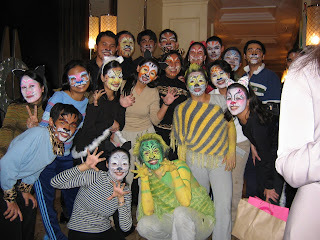 We did the 'CATS' broadway and we bested 'Phantom of the Opera' and 'Westside Story'. 'chicago' and 'Grease' garnered a tie status so they were declared as either 1st or 2nd placer. At least we won even there were so many mistakes during the performance such as the defect on the backgroud music, tapos hindi kami masyadong sabay sabay but at least... we WON... hahahaha. And something that we can be proud of, during that night, our group was the ONLY team who performed LIVE the song, others did lypsynch.